For decades, students across the country have offered up the classic excuse, "Dog ate my homework." 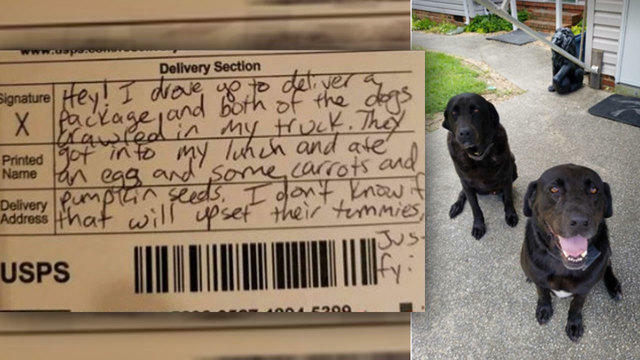 But now, a letter carrier in Smithfield, Virginia is saying, "Dogs ate my lunch." And the story that unfolded has amused thousands of people on social media. In June, Carol Jordan, who owns a five-acre farm in Isle of Wight, Virginia, stopped at her mailbox and discovered a handwritten note there from the woman who delivers her family's mail. "Our immediate thought was, 'What did the boys do now?'" she told CBS News. "The boys" in question are Bear and Bull, Jordan's 6-year-old black Labrador/mastiffs, which she and her husband rescued from a high kill shelter in North Carolina as puppies. Bear and Bull are brothers from the same litter, though Jordan notes that Bull -- the smaller one with the white spot on his chest -- is the ringleader when it comes to getting into trouble. In this instance, however, it turns out the boys actually weren't in trouble. On the contrary, the neighborhood's friendly letter carrier actually left the family a note out of concern for the dogs' well-being. It read: "Hey! I drove up to deliver a package and both of the dogs crawled in my truck. They got into my lunch and ate an egg and some carrots and pumpkin seeds. I don't know if that will upset their tummies, just FYI!" "Upon reading it, we realized the note was left because she was concerned" rather than angry, Jordan recalls. "We would never have known," she continues. "They always look guilty of something!" Though the letter carrier seemingly wasn't holding a grudge, the dogs had undeniably misbehaved. So their owners decided to "shame them on Facebook." Jordan took a picture of the pair looking guilty and created a photo composite with the image of the mail carrier's note. The post -- complete with a caption that read, "Wall of shame #weoweyoulunch" -- quickly went viral. "We've heard from people in Denmark, Australia and New Zealand that have seen the post," she tells CBS News. "Most people thank us for making them laugh. A lot of folks have made comments along the lines of 'that's like my dog' or they tag someone whose dog would act like that." To make up for the pups' mischief, Jordan then purchased a $20 Subway gift card and left it at the post office for their carrier, along with a handwritten note of apology from the boys. "Sorry we ate your lunch," read the note. "Thank you for sharing... P.S. Our humans said thank you for leaving a note. We didn't like the note, we got in trouble." Jordan posted the boys' apology to Facebook with a caption that read, "We are blown away by all the shares and likes of our two silly dogs. Here is an update to their shameful act of stealing the mail carrier's lunch. Hope you enjoy your gift card Mary - and sorry!" And with the speed of a dog running away with someone else's lunch, the post took off again. Now, Bear and Bull have a dedicated Facebook page to document their past and future misadventures. If the dogs knew that they've become internet celebrities, Jordan says the pair -- who live outside, protecting the family's electronically fenced-in five acres -- would likely "demand steak dinners and to sleep inside." Instead, they simply carry on with their usual mischief, blissfully unaware of the tens of thousands of social media reactions they've sparked.